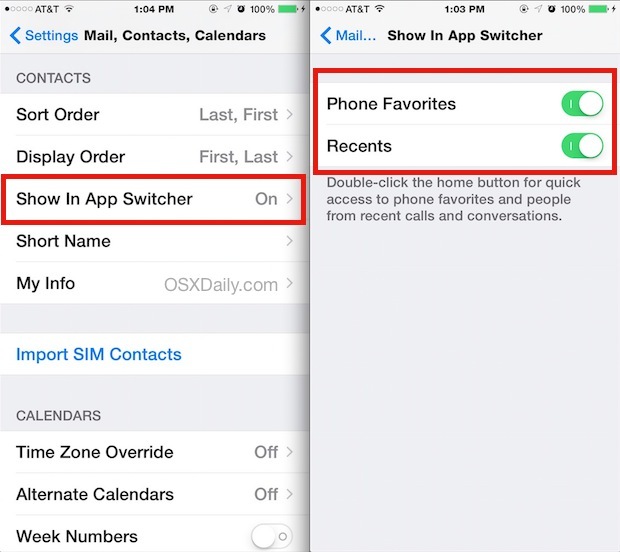 The app switcher in iOS, accessed by double-clicking on the Home button of an iPhone or iPad, is where you can quickly switch between running apps or quit out of apps you no longer want to be open. But with iOS 8, Apple decided to fill in the unused space above the open app cards with two contacts lists, complete with faces to stylize the appearance; Recent contacts, and Favorites. While this provides for another way to reach out to those contacts, you may prefer to not see those mugs on the multitasking screen. If you want to change or hide the contact faces, or perhaps you only want to see Favorites but not Recents, you can make a settings adjustment. It’s a bit buried in the Settings app and it’s easily overlooked, so don’t be shocked if you’ve passed it over before without noticing it. Note this has no impact on Phone Favorites or Recent Contacts in any other portion of iOS, it’s limited entirely to the appearance of the app switcher. With both options disabled, this returns the app switcher back to it’s appearance in prior versions of iOS, where it functioned primarily as an app interaction screen, and not an amalgamation of quitting and switching apps, with a side of contacting thrown in there for fun. Aside from having contacts and their potentially goofy pictures showing up (depending on what you set, of course), this feature can be somewhat confusing and frustrating to some users. I’ve watched more than one person try to use the faces in the app switcher as a means of sharing something from the multitasking screen, by attempting to drag and drop an app panel onto one of the faces – which obviously doesn’t share anything, at best if they swipe up with the app card it will quit out of the app instead. What these users are trying to do makes a fair degree of sense given the drag & drop behavior we’ve long been using, but at least in the example of the iOS 8 multitasking screen, it doesn’t do what they’re expecting. As usual, you can always reverse this settings change and make the faces and contacts reappear on the multitasking screen by going back to the Settings panel and turning both Phone Favorites and Recents back to the ON Position. In Contacts you can add a photo to their information. It is in the top, left-hand corner of their contact information page as it appears on your phone. Unless iOS 8 moved it. Can anyone tell me if iOS 8 added back the full-screen view of a contact’s photo when they call? 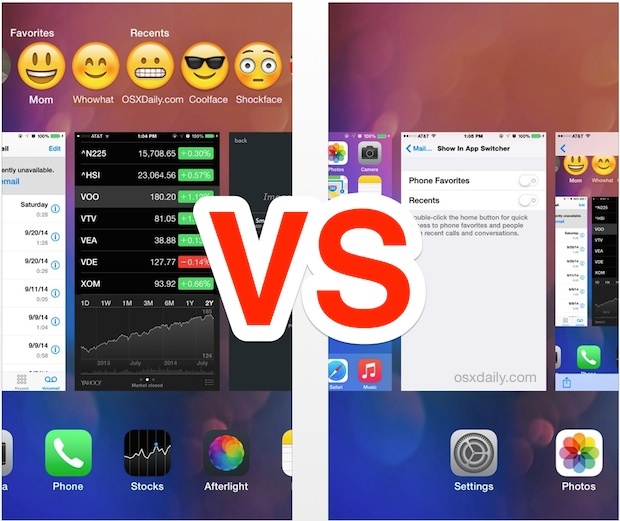 I really disliked the change to the small, round image with iOS 7. Thanks! I really did not like that. Could you tell me how you used an emoticon as a contact photo? You can go to a site like this click the emoji you want and it will show an enlarged view of the emoji and just save the photo to camera roll and add it to contacts. if there were tutorials released with the new features of IOS then i think fewer people may get confused with using them. I actually find this feature very handy. It takes less steps to send a text or call people that I text and call frequently. So it’s an actual time saver. As far as it detracting from the app switcher, it doesn’t. That still operates as usual, but now there’s a new feature using the wasted space. Thanks! Glad that is an option(s). Seeing recents was distracting to me. But not that option to change it why?